Two flagship space telescopes are returning to their respective operations after they both entered safe mode around the same time earlier this month. 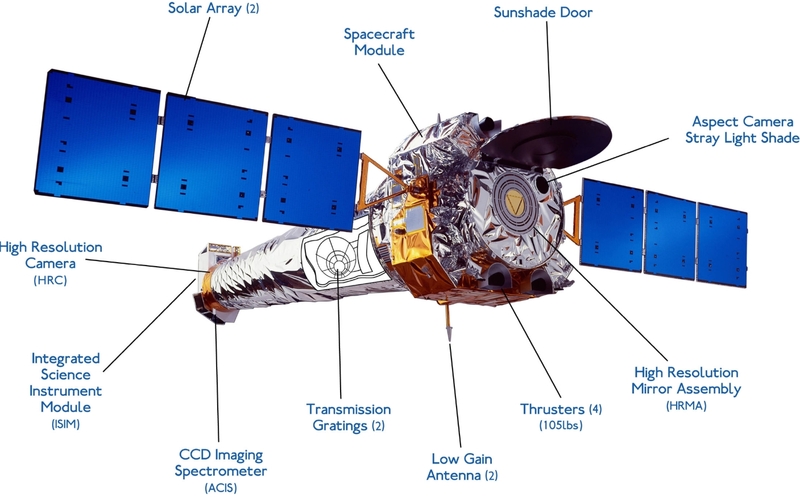 The Hubble Space Telescope is close to moving back into normal science observations following a gyro issue, while the Chandra Space Telescope has now resumed its detections of X-ray emissions from very hot regions of the universe. Hubble was the first to report a problem back on October 5, relating to a backup gyroscope that was incorrectly returning extremely high rotation rates. Hubble’s gyros measure the speed at which the spacecraft is turning, and is needed to help Hubble turn and lock on to new targets. The Hubble Space Telescope is one of the most famous spacecraft ever launched by NASA and is closing it on its 30th anniversary since launch. Shuttle Discovery – STS-31 in 1990 – was Hubble’s ride into space, with her crew including former NASA Administrator Charlie Bolden, reaching a 380 statute mile orbit – higher than most orbiters would normally head to in space. Giving birth to Hubble on orbit didn’t go as smoothly as was hoped, as one of the observatory’s solar arrays stopped as it was unfurling. The plan for such a scenario was to conduct a contingency spacewalk. However, the ground teams eventually persuaded the array to deploy. Hubble deployment during Discovery’s mission via L2 Historical. While Discovery completed her mission – and landed at Edwards Air Force Base in California on April 29 in 1990 – scientists were eagerly waiting to get their hands on the first images from the latest NASA hardware in space. Those first images showed Hubble had a problem. 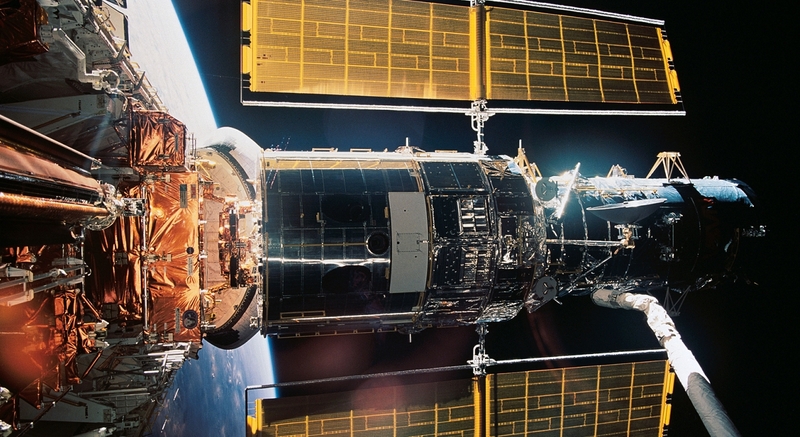 Ultimately, Discovery’s mission was a success, but the images revealed Hubble’s main mirror had been ground incorrectly, effectively compromising Hubble’s eyesight. A major effort was undertaken to fix the problem, via another Shuttle mission. 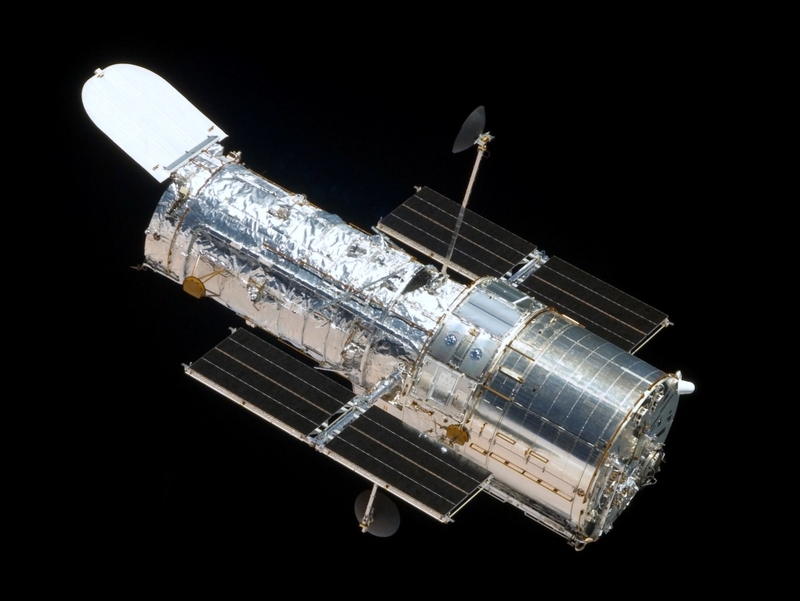 It was Discovery’s younger sister that came to the rescue of Hubble in 1993, as Endeavour launched on only her fifth mission to carry out a critical service mission, with the main goal of correcting the telescope’s impaired vision. STS-61’s five grueling EVAs in a row successfully installed a corrective optics package – along with new solar arrays – during the highly complex 11-day mission. Endeavour to the rescue during repair mission to Hubble – via L2 Historical. Hubble was back to full health and started to provide the stunning images of the cosmos that have fascinated the entire human race ever since. Discovery would return to Hubble in 1997, as STS-82’s mission upgraded the telescope’s scientific instruments and increased its research capabilities. Discovery would visit her favorite telescope once again on the third servicing mission in 1999, replacing all six of Hubble’s gyroscopes – three of which had failed – along with replacing a Fine Guidance Sensor (FGS) and the telescope’s computer. In what was Columbia’s penultimate mission prior to her tragic loss, STS-109 carried out the fourth servicing mission in 2002, with each visit extending the life of the telescope. The five-EVA mission installed the Advanced Camera for Surveys (ACS), new rigid Solar Arrays (SA3), a new Power Control Unit (PCU) and a new Cryocooler for the Near Infrared Camera and Multi-Object Spectrometer (NICMOS). Columbia also provided Hubble with a farewell push, as the orbiter reboosted the telescope to a higher orbit. However, due to Columbia’s loss the following year, NASA managers were left with a dilemma, one that was likely to result in the telescope deorbited. Hubble was next scheduled to be serviced in 2005, yet NASA’s own Return To Flight (RTF) rules insisted on the “safe haven” requirement, allowing for an orbiter, damaged during launch, to fly to the International Space Station (ISS) for its crew to wait for another shuttle to bring them home safe. Based on these rules, then-NASA Chief Sean O’Keefe resisted the calls for Hubble to be serviced, whilst noting an alternative mission using robotic assets would not be developed in time to save the telescope. 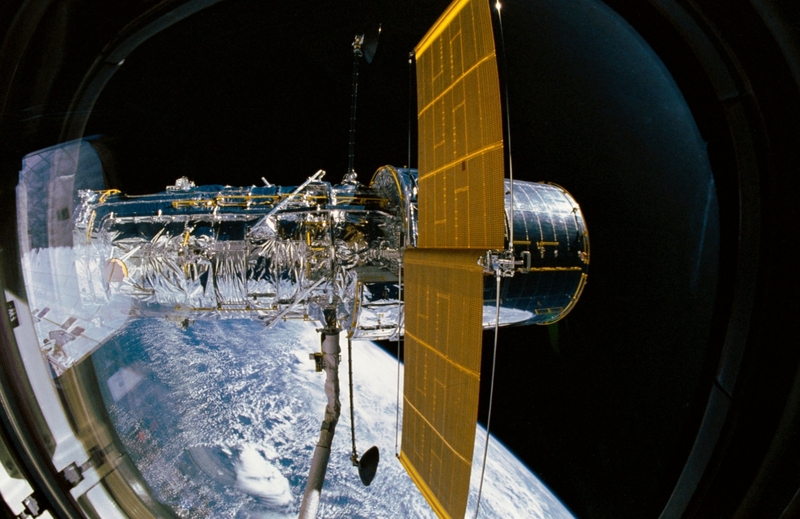 Hubble’s gyroscopes were expected to fail – and its batteries to run out – no later than 2010. Mr. O’Keefe’s successor, Mike Griffin, noted the NASA stance was based mainly on the understandable pain associated with losing Columbia and the need to not take any unnecessary chances with the orbiters and their crews during the final era of their service. As it stood, NASA was expected to press ahead with a plan to deorbit Hubble into the Pacific Ocean. Thankfully, the Return To Flight of the Shuttle fleet showed the array of safety improvements allowed for the final Hubble Servicing Mission (SM-4) to be re-evaluated. However, the challenge of launching a mission without the Safe Haven of the ISS being available needed to be solved. That solution came in the form of another Shuttle, ready to launch within days of a problem on an elaborate rescue mission. Administrator Griffin eventually approved SM-4 for Atlantis and STS-125, after the Space Shuttle Program (SSP) started to prove its new safety measures were working – such as the increasing the mitigation of External Tank foam loss and advances in Thermal Protection System (TPS) inspection, along with repair techniques – during the opening salvo of post-RTF missions. The best possible crew were assigned to Atlantis for the final rendezvous between the world-famous vehicles, led by commander Scott Altman, assisted by six crewmembers that included John Grunsfeld and Mike Massimino. Endeavour would also receive a co-star role by standing by as the STS-400 rescue mission, seeing her sat on Pad 39B ready to launch at short notice in the event Atlantis’ launch – from Pad 39A – suffered a major issue during the ride uphill on what proved to be a delayed launch date, as Hubble itself worked through problems on orbit. That contingency wasn’t required, as Atlantis and her crew conducted a flawless launch and rendezvous with Hubble in May 2009 – no easy task even under nominal conditions, as the orbiters use up nearly half of their prop capability just to reach the “height” of the telescope’s orbit and can endure higher MMOD risks. The 14-day mission involved five back-to-back EVAs, including its own challenges – highlighted by Massimino literally using brute force to pull off the STIS handrail from the telescope during EVA-4. However, the mission achieved all of its primary goals, including the installation of two new instruments, namely the Cosmic Origins Spectrograph (COS) and the Wide Field Camera 3 (WFC 3), leaving Hubble in a great condition to continue its role for many years to come. NASA explained that a wheel inside the gyro spins at a constant rate of 19,200 revolutions per minute. This wheel is mounted in a sealed cylinder, called a float, which is suspended in a thick fluid. Electricity is carried to the motor by thin wires, approximately the size of a human hair, that are immersed in the fluid. Electronics within the gyro detect very small movements of the axis of the wheel and communicate this information to Hubble’s central computer. These gyros have two modes – high and low. High mode is a coarse mode used to measure large rotation rates when the spacecraft turns across the sky from one target to the next. Low mode is a precision mode used to measure finer rotations when the spacecraft locks onto a target and needs to stay very still. In an attempt to correct the erroneously high rates produced by the backup gyro, the Hubble operations team executed a running restart of the gyro on October 16. This procedure turned the gyro off for one second and then restarted it before the wheel spun down. The intention was to clear any faults that may have occurred during startup after the gyro had been off for more than 7.5 years. However, the resulting data showed no improvement in the gyro’s performance. “On October 18, the Hubble operations team commanded a series of spacecraft maneuvers, or turns, in opposite directions to attempt to clear any blockage that may have caused the float to be off-center and produce the exceedingly high rates. During each maneuver, the gyro was switched from high mode to low mode to dislodge any blockage that may have accumulated around the float,” NASA added. Following the October 18 maneuvers, the team noticed a significant reduction in the high rates, allowing rates to be measured in low mode for brief periods of time. The following day, the operations team commanded Hubble to perform additional maneuvers and gyro mode switches, which appear to have cleared the issue. Data showed the gyro rates now look normal in both high and low mode. Hubble then executed additional maneuvers to make sure that the gyro remained stable within operational limits as the spacecraft moved. The team saw no problems and continued to observe the gyro through the weekend to ensure that it remained stable. 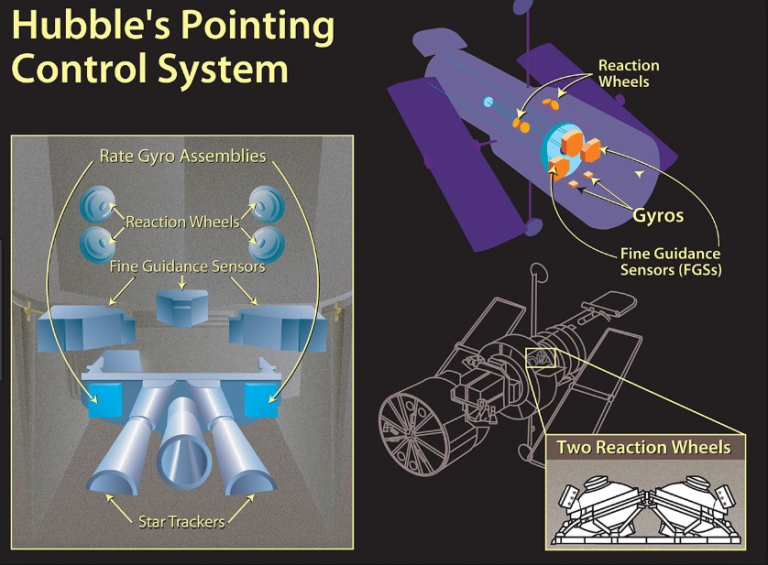 “The Hubble operations team plans to execute a series of tests to evaluate the performance of the gyro under conditions similar to those encountered during routine science observations, including moving to targets, locking on to a target, and performing precision pointing. After these engineering tests have been completed, Hubble is expected to soon return to normal science operations,” NASA said. Meanwhile, the Chandra X-ray Observatory has returned to science operations. Chandra’s launch was the most eventful element of the spacecraft’s early days, with Shuttle Columbia having several tantrums before finally lofting the spacecraft into space. STS-93 suffered an abort just seconds prior to the initial launch attempt, before finally launching on 23 July 1999 from KSC’s 39B. Eileen Collins became the first female shuttle Commander on this flight. Problems were noted immediately after liftoff, when a gold pin – used to plug an oxidizer post in Columbia’s right engine – came loose and was violently ejected during ignition, striking the engine nozzle’s inner surface and tearing open three cooling tubes containing hydrogen – causing a leak. An electrical short in the center engine’s primary controller also kept controllers busy, before Columbia made it to orbit, albeit ending with a LOX Level Cutoff. The Chandra X-ray Observatory (CXO), previously known as the Advanced X-ray Astrophysics Facility (AXAF), is a Flagship-class space observatory. As with Hubble, a gyro was believed to be the issue relating to entering safe mode on October 10. Safe mode involves putting the observatory into a safe configuration, where critical hardware is swapped to backup units, the spacecraft points so that the solar panels get maximum sunlight, and the mirrors point away from the Sun. “Analysis of available data indicates the transition to safe mode was normal behavior for such an event. All systems functioned as expected and the scientific instruments are safe. The cause of the safe mode transition (possibly involving a gyroscope) is under investigation,” NASA noted at the time. Five days later, the cause of Chandra’s safe mode event was understood and the Operations team successfully returned the spacecraft to its normal pointing mode. The safe mode was caused by a glitch in one of Chandra’s gyroscopes resulting in a 3-second period of bad data that in turn led the onboard computer to calculate an incorrect value for the spacecraft momentum. The erroneous momentum indication then triggered the safe mode. “The team has completed plans to switch gyroscopes and place the gyroscope that experienced the glitch in reserve. Once configured with a series of pre-tested flight software patches, the team will return Chandra to science operations which are expected to commence by the end of this week,” NASA added. That remedy appears to have worked, as on Tuesday NASA noted that Chandra had returned to science operations, with more details to follow later in the week. NASASpaceFlight.com, now in its eighth year of operations, is already the leading online news resource for everyone interested in space flight specific news, supplying our readership with the latest news, around the clock, with editors covering all the leading space faring nations. Breaking more exclusive space flight related news stories than any other site in its field, NASASpaceFlight.com is dedicated to expanding the public’s awareness and respect for the space flight industry, which in turn is reflected in the many thousands of space industry visitors to the site, ranging from NASA to Lockheed Martin, Boeing, United Space Alliance and commercial space flight arena. With a monthly readership of 500,000 visitors and growing, the site’s expansion has already seen articles being referenced and linked by major news networks such as MSNBC, CBS, The New York Times, Popular Science, but to name a few.